Total contact casting is used in the treatment of all types of ulcers occurring on the bottom of the foot. As the name implies, this type of cast, when properly applied encompasses the total plantar (bottom) surface of the foot. In doing so, walking pressure is then more evenly distributed over the entire surface of the bottom of the foot and thus pressure is removed from the ulcer site. It is important to point out here that regardless of the origin of the ulcer, be it a diabetic ulcer, neurotrophic ulcer, vascular ulcer or traumatic ulcer, in almost all these cases the skin actually begins to break down and ulcerate due to too much pressure in one part of the foot. This form of casting is also the primary form of treatment in Charcot foot. The idea of total contact casting was "invented" in India where it was first used to treat trophic ulcerations as the result of Hansen's disease back in the 1930's. Dr. Paul Brand bought the technique to the United States, where he modified the application slightly and started using it in the treatment of diabetic foot ulcers. Over the years numerous studies have shown the effectiveness of this type of treatment. Healing rates of ulcers on the bottom of the foot range from 73 to one hundred percent with this procedure. In many medical circles TCC is considered the gold standard in the treament of foot ulcers. In wound care there is a saying, "It's not so much what you put on the wound that matters, as much as what you take off (pressure)." The use of total contact casting may reduce the pressure on the bottom of the foot anywhere from 80-90 percent compared to the pressure of wearing sneakers. Again, since excess pressure causes ulcerations AND inhibits their healing, reducing the pressure this much will go a long way to allow the ulcer to heal. The more popular theory is that the cast reduces pressure in a certain spot by increasing the weight-bearing surface of the foot. Through the use of the cast one is increasing the surface area through which the plantar forces of ambulation will run and this in turn will reduce the pressure applied to any one given section of the foot. A typical scenario is the person who exhibits a cavus foot type (high arches). Typically this person will develop ulcers under the ball of his foot because body weight is not being picked up by the arch but instead goes from the heel to the ball of the foot. With total contact, the mid portion of the foot, the arch area, picks up some of the body weight and in doing so reduces pressure on the ball of the foot. The more recent theory is that through this type of casting a situation known as load sharing occurs. It has been shown through experimentation that the rear part of the cast along with the heel and tibia, absorbs a lot of the pressure during ambulation and in doing so reduces pressure on the fore part of the foot. Reduce edema- The problem with edema is that is slows down the healing process in that blood flow is restricted to the ulcerated area. Blood pools in the area so there is a reduced turnover of blood. Blood is what carries nutrients to the wound in order for the wound to heal. Casting is so effective in reducing edema that the first cast should be changed a few days after its application otherwise it will become too loose and lose its effectiveness. Reduce infection- Some experts also argue that casting reduces the chance of infection. The logic here being that if the wound is covered with a proper dressing, there is less chance of infection occurring. Patient compliance- Perhaps the biggest reason that casting helps heal a wound besides pressure reduction, is patient compliance. When a total contact cast is applied the patient has no choice but to comply with his doctor's orders because the cast itself is very difficult to remove. This cannot be said of removable cast walkers which are prefabricated devices that are applied to the foot and leg and held in place with velcro closures. Even though research has shown that removable cast walkers are very effective in treating plantar ulcerations they are very easy to remove and so in many cases, patients are not compliant. 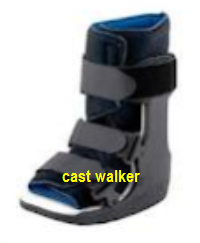 Studies have shown that those wearing removable cast walkers, on average, only wear them anywhere from 28 to 60 percent of the time. Not very impressive! Diminished activity- With either type of cast the patient wears, activity is going to be greatly diminished and this is good for the healing process. Of course with any medical therapy there is always the chance of complications. Fortunately, in this instance most complications are minor. Skin abrasions and sometimes pressure ulcers. In most cases this is the result of areas of the cast being too tight against the skin and in most instances the problems do not occur on the bottom of the foot, but rather the sides of the foot or perhaps the sides of the ankle or lower leg. These problems tend to be easily treatable usually by making adjustments to the cast or changing the casting technique somewhat. These minor wounds tend to heal quickly simply because they are not on the bottom of the foot. Maceration (excessive moisture), fungal infection as a result of the maceration. Claustrophobic type response from the cast being too tight. Difficulty in walking- some people simply cannot walk with the cast. Patient non-compliance- There are also times when undiagnosed infection is occurring in the foot, either soft tissue or bone and of course the application of a cast only makes matters worse. Having said that, most problems can be avoided or controlled by frequent cast changes. Developing an ulcer on the other foot- It should also be pointed out since many individuals who have ulcerations on one foot have the potential to develop ulcerations on the other foot, care must be taken to inspect the good foot as well. Wearing a total contact cast increases the pressure and demands on the good foot during ambulation.